We'll be running local bus services right through the holiday season, only taking a break on Christmas Day. There'll be special timetables on our 1 and 2 routes on Boxing Day and New Year's Day. 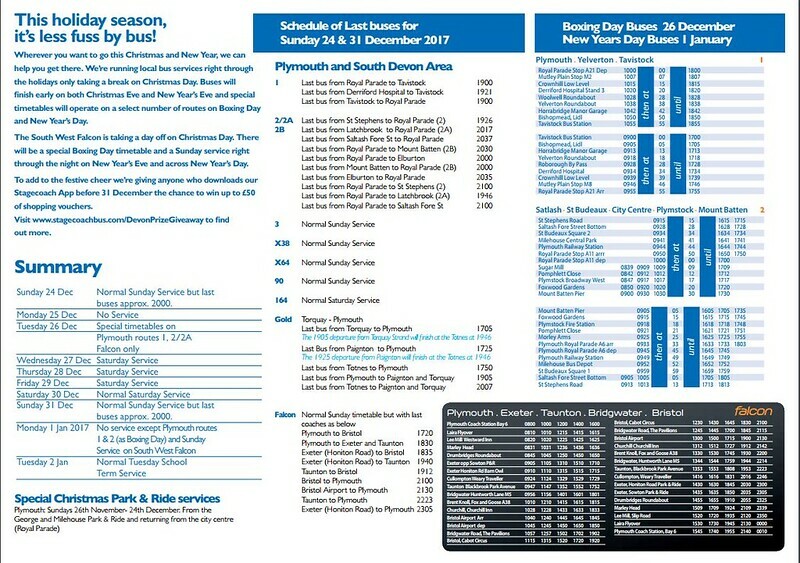 Well done to Stagecoach for providing such a comprehensive digest across several pages on their web site. When they do decide to reveal all I will of course mention it here. So Stagecoach have services Boxing Day and New Years Day. This is very good for us lucky enough to live on one of their routes and those who have to work etc. Well done for being modern and thanks to the volunteers for driving these days. It's a pity Stagecoach South West cannot extend a New Year's Day service to the rest of their empire. If they at least ran the same service as Boxing Day (as they are doing in Plymouth) that would be a start. Tuesday 2nd Jan is a bank holiday so I would have thought Sunday service not normal service resumed? January 2nd is only a Bank holiday in Scotland. Aon Dec 4th 21:07 - It's actually standard practise across many areas. It will only be certain routes running and not a full service, and also drivers would likely be paid extra for it, which is why some offer to do it. Actually, Anonymous 4/12/17 21:07, Stagecoach will have planned this carefully: they cannot force drivers into work on public holidays and offer premium pay rates for the 7 or so drivers who are willing to do this, helping those who do need to work to get around. Agree completely with the Anonymous 4/12/17 07:45, nowadays people do work on boxing day and need to get to work. In Oxford they are even running services on Christmas Day, which I believe are possibly the only ones in the country, please correct me if I am wrong, they are the only ones around the area at least! We get this every year. AIUI, the Stagecoach staff working are volunteers, so what's the problem? There are many reasons that people might choose to work on Boxing Day. Some people don't get that choice and still have to find a way to travel to and from work. Have something interesting to say? Please share it here! Win your money back when shopping. It works! Did by Graham. Powered by Blogger.